Weather reporters do not have it easy. They are damned if they play dress up, and are usually damned if they don't. News broadcaster KTLA came under social media fire after meteorologist Liberte Chan was made to wear a grey cardigan sweater over her sequined black dress, because the channel was "getting a lot of emails". Weirdly enough, she was asked to put it on during a live telecast. In the middle of her report, a hand dangling the sweater appears on screen and Chan is heard asking, "what's going on? You want me to put this on? Why? Cause it's cold?" The man, who turned out to be anchor Chris Burrous, replies, "We're getting a lot of emails." While Chan laughed off comments that the incident was sexist, social media agreed to disagree. She was mostly inundated with supportive messages in a poll on Facebook on whether the dress was too revealing. The broadcast attempted a subtle dig at the hate comments as Burrous read some of the comments. The show ended with a shot of the male anchor sitting in his shorts. But the dig was so subtle that viewers only got it after Burrous pointed it out. 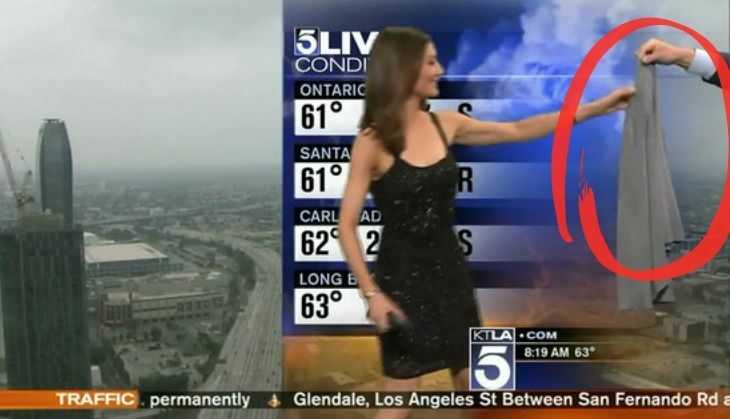 As Twitter pointed out, not only was this a case of sexism by the viewers who complained, it also displayed the blatant double standards towards women as a user shared a screengrab of a 2012 KTLA weather report of a male meterologist presenting while two swimsuit clad women stood by his side. Oh well, nothing new about double standards regarding women, is there? @Heather_Poole @KTLA Sometimes public shame drives home the msg. I'm sure she new better. It's morning news not a nightclub.